Self-Propelled Man Lift - 4 wheel drive - Dual Power (31 hp Kubota Gasoline engine or 24 v DC). Traveling Specs: Length - 18' 3" - Width 5'6" - Height 6'6". Weight 5,600 lbs. with foam filled tires. 350 degree NON-CONTINUOUS turntable rotation. Maximum working height - 51'. Maximum platform height - 45'. Platform dimensions: 5' wide x 30" deep. 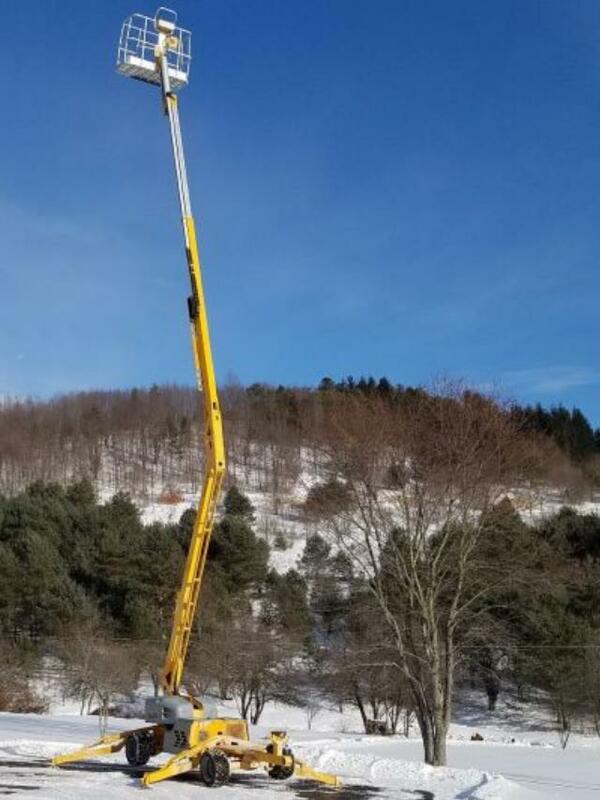 Up and Over height with level boom: - 20' 9". Maximum side reach from edge of foot-pad: 21'. Maximum side reach from center of lift: - 27'. Maximum cage weight capacity - 2 person basket - 500 lbs. Drive speed: Variable to 3.5 mph - Slope gradeability: 45%. 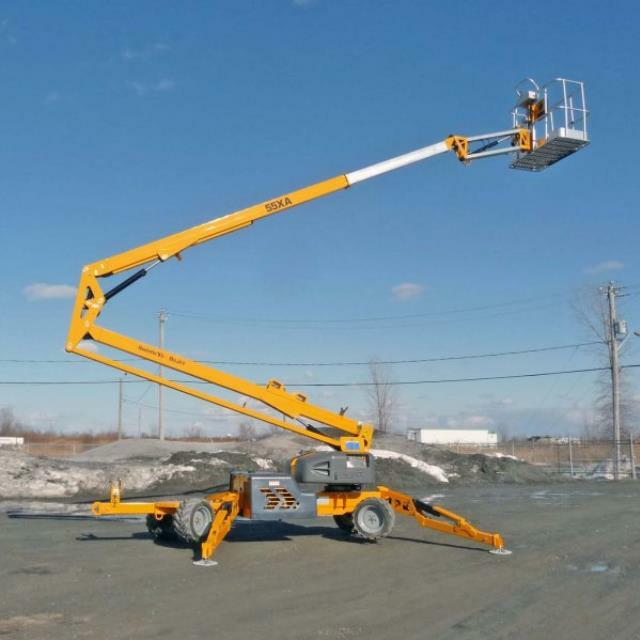 Automatic leveling hydraulic outriggers up to 12.5 degrees. Inside turning radius: - 10'. Outside turning radius: - 17'6". Air, water, and 120 v lines available to the platform. Tilt sensor and alarm for safe operation. Outrigger footprint: - 12' 4" x 11' 4". Can be operated while battery charger is plugged in. Proportional controls for smooth operation. 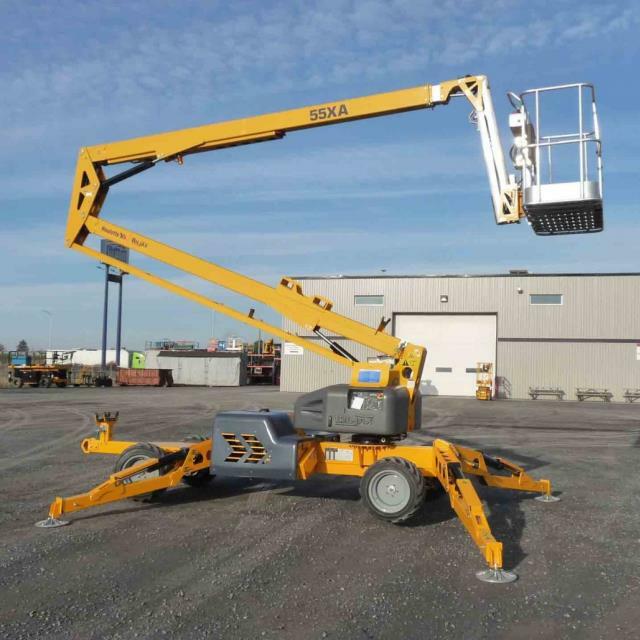 * Please call us with any questions about our manlift 45 foot s prop biljax 45xa rentals in Oak Grove MO, Blue Springs MO, Independence MO, Lexington MO, Odessa MO, Independence MO and Western Missouri.